"I would describe (Weiss’s) performance here as lovingly sensitive and very detailed …"
"... a marvelous disc ... explores the full range of Gershwin’s considerable gifts ... Falletta and the Buffalo forces really capture the spirit of the work ... the whole disc has spectacular sound and everyone gives 100 percent." "The overwhelming impression of this performance, indeed of the whole album, is how much Falletta loves this music ... beautiful sound engineering throughout, with an especially good bass response. JoAnn Falletta truly is a gift to American music." 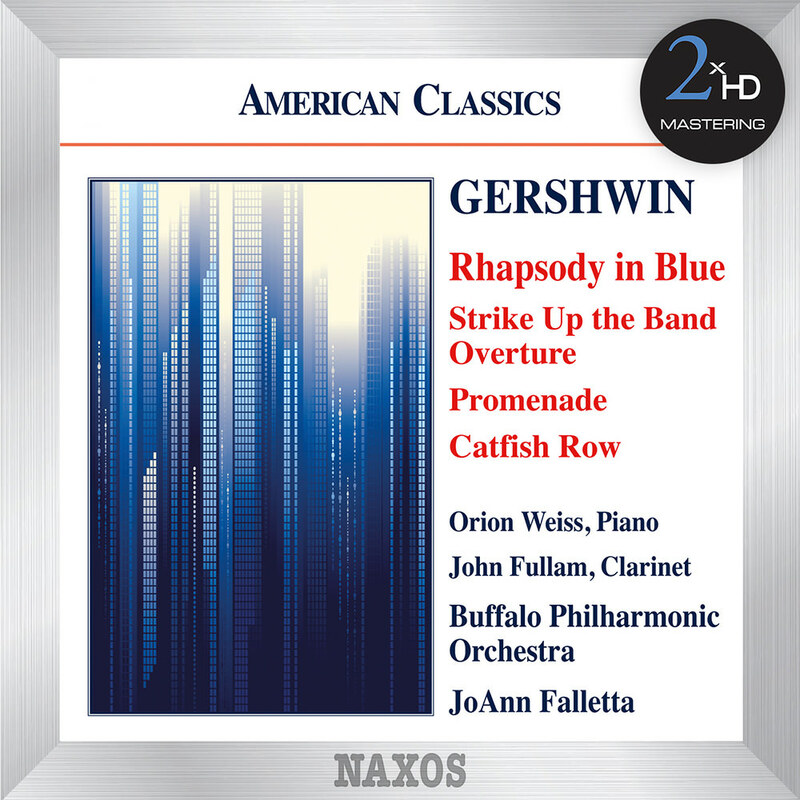 Conductor JoAnn Falletta's second Gershwin album includes some of the composer's best known material, including his masterpiece Rhapsody in Blue with guest pianist Orion Weiss. Promenade, reconstructed from a 1937 film score, features solo clarinetist John Fullam who adapted this piece for clarinet and orchestra. The album's closer, Catfish Row, is Gershwin’s concert suite from the opera Porgy and Bess. *Recorded in PCM 96 kHz / 24-bit. Mastered in PCM 352.8 kHz / 24-bit, 192 kHz / 24-bit, 96 kHz / 24-bit and DSD 2.8224 MHz / 1-bit, 5.6448 MHz / 1-bit. This album was mastered using our 2xHD proprietary system. In order to achieve the most accurate reproduction of the original recording we tailor our process specifically for each project, using a selection from our pool of state-of-the-art audiophile components and connectors.The process begins with a transfer to analog from the original 96kHz/24-bit resolution master, using cutting edge D/A converters. The analog signal is then sent through a hi-end tube pre-amplifier and (if needed) will be EQ’d before being recorded directly in DXD using the dCS905 A/D and the dCS Vivaldi Clock. All connections used in the process are made of OCC silver cable. DSD 2.8224 MHz/1-bit and PCM 352.8kHz/24-bit and 192kHz/24-bit versions are separately generated, directly from the analog signal.